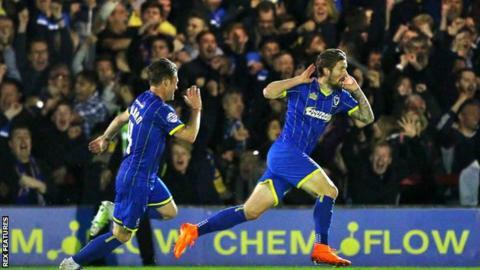 Tom Beere struck in stoppage time to give AFC Wimbledon a narrow first-leg lead over Accrington Stanley in their League Two play-off semi-final. The hosts' Lyle Taylor dragged a low shot just wide in a first half that did not produce a single shot on target. Substitutes Tarique Fosu and Adebayo Akinfenwa struck the post for Accrington and Wimbledon respectively. Beere's low finish gave the Dons the advantage going into Wednesday's return leg at the Wham Stadium. Accrington, who were denied automatic promotion on the final day of the league season, arrived at Kingsmeadow on the back of five consecutive away wins. But both sides struggled to get going in a nervy first half which lacked quality. The Dons, who are appearing in the Football League play-offs for the first time since the phoenix club's formation in 2002, were playing on the 28th anniversary of Wimbledon's famous FA Cup win over Liverpool. They grabbed a fifth win in six home games in the final moments of the game when Beere kept his cool to slot in past a crowd of players and net his first ever goal for the club. The hosts had earlier appealed for a penalty, after the ball appeared to strike Accrington's Tom Davies on the arm in the area from a dangerous free-kick. Match ends, AFC Wimbledon 1, Accrington Stanley 0. Second Half ends, AFC Wimbledon 1, Accrington Stanley 0. Attempt missed. Tom Davies (Accrington Stanley) header from the centre of the box is close, but misses to the right. Assisted by Adam Buxton with a cross following a set piece situation. Scott Brown (Accrington Stanley) wins a free kick on the right wing. Corner, Accrington Stanley. Conceded by Darius Charles. Attempt saved. Shay McCartan (Accrington Stanley) header from the centre of the box is saved in the bottom left corner. Assisted by Terry Gornell with a headed pass. Foul by Terry Gornell (Accrington Stanley). Darius Charles (AFC Wimbledon) wins a free kick in the defensive half. Goal! AFC Wimbledon 1, Accrington Stanley 0. Tom Beere (AFC Wimbledon) right footed shot from the centre of the box to the bottom right corner. Attempt blocked. Tom Beere (AFC Wimbledon) right footed shot from the centre of the box is blocked. Assisted by Adebayo Akinfenwa. Hand ball by Adebayo Akinfenwa (AFC Wimbledon). Attempt blocked. Adebayo Akinfenwa (AFC Wimbledon) right footed shot from the centre of the box is blocked. Assisted by Paul Robinson. Substitution, Accrington Stanley. Shay McCartan replaces Piero Mingoia. Foul by Tarique Fosu-Henry (Accrington Stanley). Tom Beere (AFC Wimbledon) wins a free kick in the defensive half. Substitution, AFC Wimbledon. Tom Beere replaces Sean Rigg. Corner, AFC Wimbledon. Conceded by Tom Davies. Attempt blocked. Adebayo Akinfenwa (AFC Wimbledon) header from the centre of the box is blocked. Assisted by Callum Kennedy with a cross. Offside, Accrington Stanley. Adam Buxton tries a through ball, but Terry Gornell is caught offside. Substitution, Accrington Stanley. Terry Gornell replaces Billy Kee. Attempt missed. Billy Kee (Accrington Stanley) right footed shot from outside the box is close, but misses to the left. Attempt missed. Jake Reeves (AFC Wimbledon) right footed shot from outside the box is close, but misses to the left following a corner.